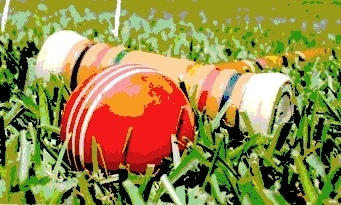 The 13th annual Lanterman House 9 Wicket Tournament, played during the Memorial Day weekend, featured several new teams making the finals and winning titles. The weather was unusually cold and blustery for Southern California. 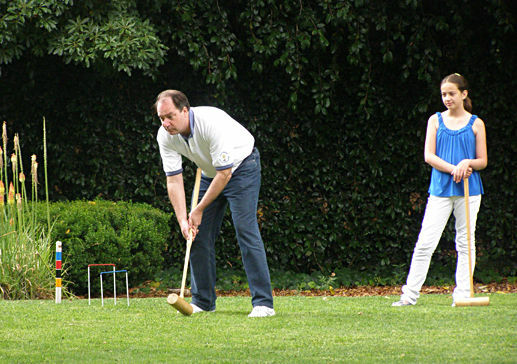 The finals were played on the grounds of the historic Lanterman House in front of a crowd of croquet enthusiasts and museum visitors. Play was in two divisions: adult doubles and adult/child doubles. Each division had a champions bracket (for past winners and very good players) and an open bracket (for other levels of experience). The only repeat winners were in the adult doubles champions bracket, where two-time defending champions Steve Del Guercio and Jim Kambe handily beat the 2005 winners Caren and Eric Sawyer by the score of 25-15. The Del Guercio/Kambe team has dominated this bracket for many years and has never lost to the Sawyers. But this year there was a record number of teams in this bracket, which may mean stiffer competition in future years. The most exciting final match was in the adult doubles open bracket. The husband and wife team of Linda and Dave Nydam, who have previously made the finals but not won, played the Hingst husband and wife team, who are also regular players in this event. The match was nip and tuck throughout. In the last play of the game Linda Nydam staked out, with Don Hingst only two feet from doing so if she had missed. The adult/child champions bracket featured the biggest upset. Because only three teams entered this year, the players decided to have a round robin to decide which two teams would make the finals. Two-time defending champions David (father) and Lucas (son) Collins faced off in the finals against Steve Del Guercio and his daughter Cami, who moved up this year from the adult/child open bracket. The match was well-played, with plenty of strategy. In the end, the Del Guercio team staked out at the 35 minute mark to upset the Collinses by the final score of 28-25. This was the first defeat for the Collins team in this event. Finally, the adult/child open bracket final was a battle between two teams new to the bracket. The sister-sister team of Margo and Lauren Kambe staked out at the 31 minute mark to defeat the team of Chris Ruiz (father) and Ryan Ruiz (son), who were playing in their first croquet tournament. As always, the tournament is indebted to the Lanterman House Executive Director Melissa Patton; Tournament Director Jim Kambe; Bob Moses, who served as head referee; and the generosity of Mr. Richard Dewey of the Croquet Sport Company, who has donated croquet equipment to the tournament for many years.